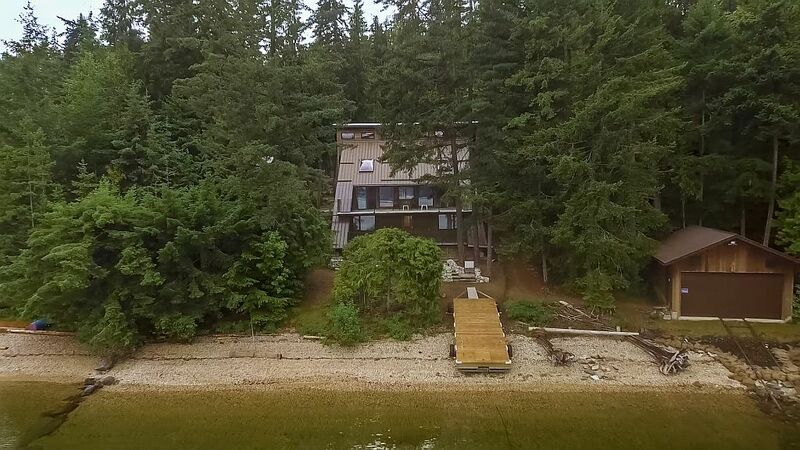 150 Ft of private Shuswap Lake WATERFRONT! Never before offered, this original family estate offers a beautiful, serene setting with tons of privacy on a fully usable 0.9 Acre lot with a full 4 Bedrm cabin with double attached garages, a detached 24'x42' shop & a 24'x40' RV carport! The 1990's home offers tons of Shuswap style lakehouse decor with huge vaulted ceilings & open beam layout clad with cedar wall board. Rock clad wood burning fireplace, built in TV/stero & wood shelving. Two Huge lakeside decks that hang just steps from the 150 Ft of private lakeshore. There's a full floating dock, boat buoy & boat house with lake rails for easy in/out access. Geo-thermal heating & cooling system; Health Canada approved septic system & prIstine lake intake water system. The home & property are carefully maintained & pride of ownership shows throughout. The galley kitchen can easily be extended into the single garage beyond & a new master bedroom suite can be added to the far side of the cabin making this the perfect Shuswap Lake get-away for your family. Wall to wall lakeview windows in the LR & DR with sliding patio doors onto the deck. See more info here including a virtual tour & drone video then call Rob McKibbon to arrange your viewing appointment 250-804-6288 or SOLD@BIGRob.ca.